These were from Easter. 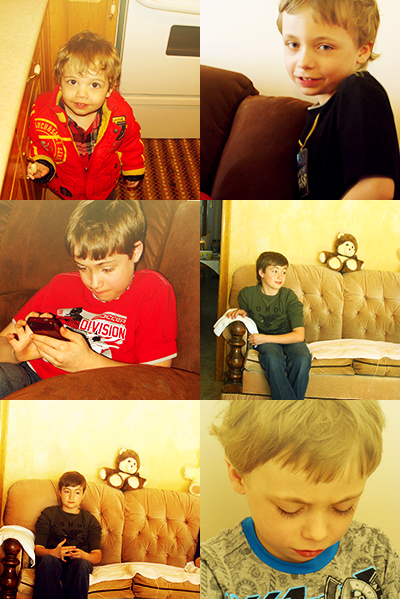 Pictures of my nephews. Richard, Michael and Logan (from oldest to youngest). They are getting so big, Richard is going to be 11 next week. I had a blast with nytel at the Calgary Expo. I tried some restaurants like Milestones (sooooo good). It was so busy (seriously, I think there was at least 50 thousand people there since at one point the fire Marshall were not letting people in and 50 thousand was the capacity of the venue). If I go again next year (depending on the guests) I might invest in a VIP ticket. Which lets you get in front of the lines and have front row seats. I'd like to see more of the tables, it was packed and I wanted to find myself a sonic screwdriver but I did find some Doctor Who Magnets. I also would like to buy some art next time. Star Trek: It was really great seeing all of the stars! My favourites were Wil Wheaton, Patrick Stewart and Gates McFadden. Gates talked about mostly plays and stuff she is doing. Wil Wheaton talked about his Tabletop thing he films with Felicia Day, which I now need to watch. He also talked a little bit about his sons and some of his work he's been doing. He also mentions that the geekiest person on The Big Bang Theory is in fact Kaley Cuoco. He also told a story of how someone came up to him and asked what his real name is cause he plays Wil Wheaton The Big Bang Theory, lol. I loved just listening to Patrick Stewart talk. I didn't even take many photos of him. For some reason I teared up a bit, lol good thing I didn't actually get a auto of him. He's been doing a lot of Plays in England but will be taking a short break and will be doing Films. 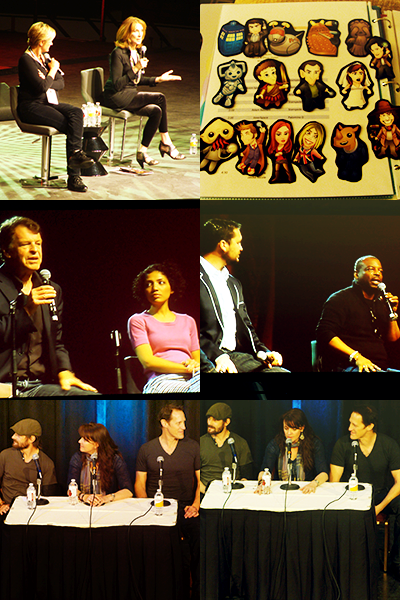 Fringe: I just love John Noble and Jasika Nicole. They are both really really nice, especially John Noble. I got to shake his hand and he was just such a lovely man. I teared up a bit when I found out that Jasika Nicole has a sister with Autism and she put it great that she is blessed to know someone with Autism. My nephew has Autism and I understood what she meant. The Adam Baldwin panel was great even if I didn't get a good pic of him. The James Marsters panel was great, even if it was in a big hall he tried to make eye contact with all the people asking questions and called everyone sweetie. He talked doing Audio Books for Jim Butcher books ( which I now need to get) and someone asked him if he knew that they left some of his colourful commentary in, lol. Apparently he likes to add commentary about the book that the producers hopefully cut out, lol. He also talked about his role on Buffy and how he was just try and get the job so he didn't have to go to jail for tax evasion, lol. He kept mentioning it so I think he was serious. He also said that in between takes on Supernatural the boys would pretend to grab his junk, lol. There was a surprise guest at the Sanctuary panel :) Ryan Robbins, who was in Calgary filming Hell on Wheels! Yes, he's going to be on Hell on Wheels with Chris! Amanda talked about Sanctuary. Basically, the Studio that they film in doubled the rent and the people that fund Sanctuary didn't like that. So they are still in talks with Syfy about either getting another season (according to Amanda Syfy wants another season for Sanctuary) or a miniseries possibly. In the mean time they had to pack up the Sanctuary set. This entry was originally posted at http://jenniferjensen.dreamwidth.org/368924.html. Please comment there using OpenID. Thanks for sharing the photos and telling us how it went. awww looks like an awesome time!!!! Your photos from the con turned out great! awww thanks, for every good photo I took there were 30 blurry ones. lol.